A stock clerk was sent to clean up a storeroom in Maui, Hawaii. When he got back, he was complaining that the storeroom was really filthy and that he had noticed dried mouse or rat droppings in some areas. A couple of days later, he started to feel like he was coming down with a stomach flu, complained of sore joints and headaches, and began to vomit. He went to bed and never really got up again. Within two days he was severely ill and weak. His blood sugar count was down to 66, and his face and eyeballs were yellow. He was rushed to the emergency at Pali-Momi, where he was diagnosed to be suffering from massive organ failure. He died shortly before midnight. No one would have made the connection between his job and his death, had it not been for a doctor who specifically asked if he had been in a warehouse or exposed to dried rat or mouse droppings at any time. They said there is a virus (much like the Hanta virus) that lives in dried rat and mouse droppings. Once dried, these droppings are like dust and can easily be breathed in or ingested if a person does not wear protective gear or fails to wash face and hands thoroughly. This is why it is extremely important to ALWAYS carefully rinse off the tops of canned sodas or foods, and to wipe off pasta packaging, cereal boxes, and so on. Almost everything you buy in a supermarket was stored in a warehouse at one time or another, and stores themselves often have rodents. Most of us remember to wash vegetables and fruits but never think of boxes and cans. The ugly truth is, even the most modern, upper-class, super store has rats and mice. And their warehouse most assuredly does! The investigation of soda cans by the Center for Disease Control in Atlanta discovered that the tops of soda cans can be encrusted with dried rat's urine, which is so toxic it can be lethal. Canned drinks and other foodstuffs are stored in warehouses and containers that are usually infested with Rodents, and then they get transported to retail outlets without being properly cleaned. It is folly to imagine that we cannot have this problem in the USA. We have thousands of illegal aliens invading the USA every year from Mexico and other developing nations. I find it amazing that we don't have more disease of this sort breaking out regularly. I recall going for a walk in Chinatown in Los Angeles in the 1980s. We had eaten at the Hunan, a great restaurant, and we walked up the hill nearby a couple streets higher. There was a Chinese grocery-- a large one, and being evening, it was closed. We all went to look in the big windows because our friends said they sold 100 year old eggs there. We saw the eggs in a big basket, but we started noticing movement here and there. On looking closer, we realized the whole inside of the store was crawling with rats. Now, this is not something extreme. 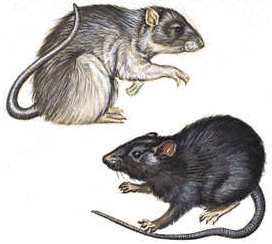 It simply shows that rats and cockroaches live with people. You may not like it, but you are very important to rats-- they would go extinct without you here. Problem-- They visit you all your neighbors too-- Like the ones with AIDS and the ones with the flu. Smart people will guard their homes against rat and mouse infestations, but many people have no fear of the rats they never see-- the ones at the super market. What is the answer? Wipe EVERYTHING you bring home from the grocery store with Lysol in a washcloth. Lysol will kill AIDS and all other viruses.